Despite sounding somewhat similar to the Caribbean Islands, the area of Wolverhampton City Centre once known as “Carribee Island” was no place in the sun! “CRIBBEY – ISLAND” the place was called, yet twas no harbour seen; Nor, save the songbirds patch of turf, a single blade of green. How this small enclave of Stafford Street and Canal Street was so called I have never been able to discover, but all my life it has held a strange fascination for me. In 1797 a report on the Parish Poor of the district was published and contained a list of the poor of “Cribbey Island”. Parish Poor of the Town in the 18th century – a list of those who received out-pay, dated September 11th, 1787. My theory behind the naming of “Cribbey Island” is that at this time, The Bridewell, a House of Correction (or local prison if you prefer), stood on the corner of Littles Lane and the more familiar, or humorous name given to this place of incarceration was “the Crib”. This, coupled with the fact that the top half of Stafford Street was part of a continuation of Berry (Bury Street), may well be the reasoning behing “Cribbury” – later Carribee and Carbery. Alas, any notions of an island paradise in the sun seem fanciful. Conflict between England and Ireland had taken place over many centuries, with Henry II declaring himself “Lord of Ireland” way back in 1171. Set against this backdrop of animosity, it is perhaps not surprising that in his 1839 essay, Chartism, the great essayist, Thomas Carlyle, bemoaned one of the pre-eminent features of Victorian demography, that of Irish immigration. He would note that there would be “crowds if miserable Irish darken our towns“, such was the attitude in those times. 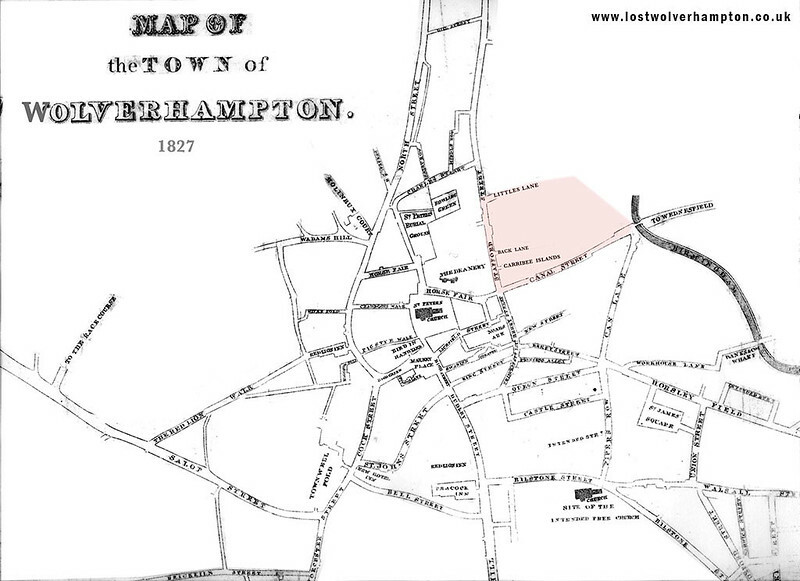 An Irish colony had initially developed in Wolverhampton during the early decades of the nineteenth century, when canal construction, road improvement schemes and, later, the advent of the railways, offered numerous employment opportunities. The Irish famine of 1845-6 witnessed a further influx of immigrants, principally from the counties of Roscommon, Sligo, and Mayo. 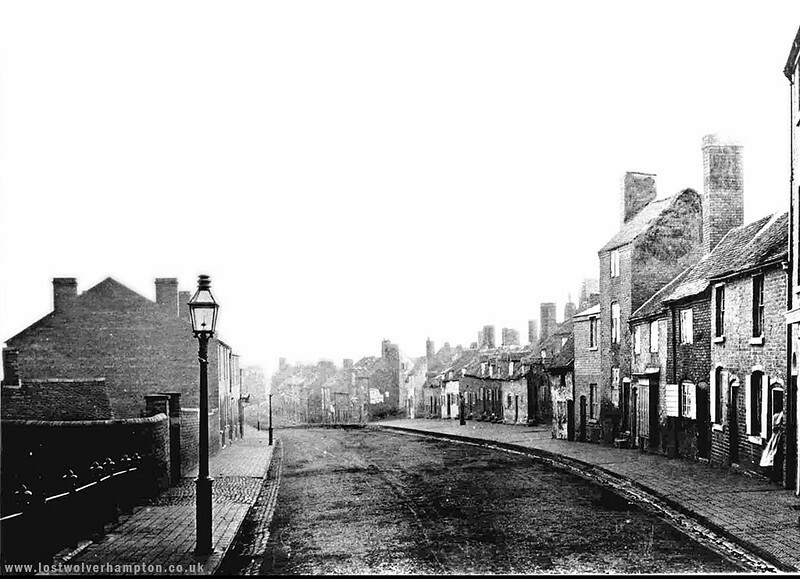 The Irish community of Wolverhampton lived, primarily, in dwellings secreted by the courts and alleyways leading off Stafford Street and Canal Street. This was a district chiefly characterized by unsanitary and overcrowded living conditions and contained a mixture of lodging houses, pubs and beer shops. The most notorious enclave within this district of immigrants was the afformentioned Caribee Island. 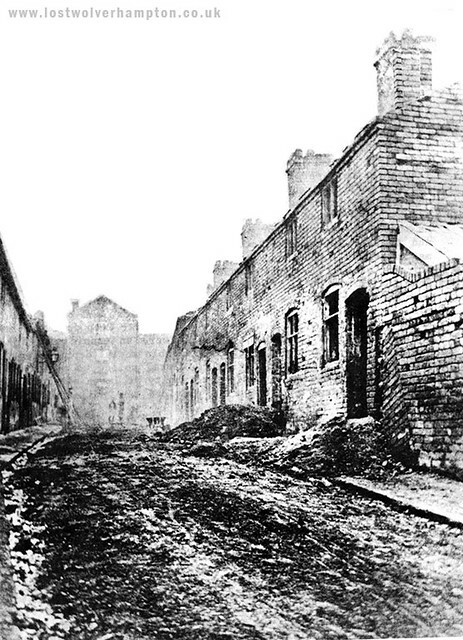 The area, pictured above, was described as a collection of the most squalid looking houses on the north side of Stafford Street inhabited by the lowest class of Irish. One of the many Irish immigrants who came over to escape the starvation of the terrible Irish potato famine was Michael Egan, my great grandfather. 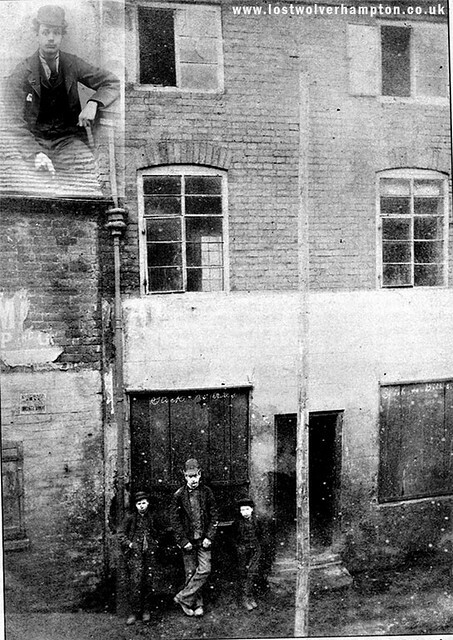 He is pictured here in Stafford Street where he boarded upon arrival. Michael hailed from Roscommon and was a navvie when he met and married Frances Webster, a lady he had met travelling through Warwickshire. In the 1871 census, we find Frances Webster with John Egan, a son aged 2, lodging with Irish relatives, Samuel and Anna Fenn, in Dunstall Lane. The census of 1881 shows Michael had found accommodation close to Dunstall Lane, at No. 7 Lawyers Field. On the bottom right of the picture above, at the side of the old house with the tattered bill-poster on the wall, is the entrance to Deanery row and Lawyers Field. Just a few yards up from the opening stands The old “Feather’s Public House” – (the building is still standing today although not that one) – and before it was de-licensed and passed on to the University in 2015 it was considered the oldest full-licensed house in Wolverhampton, dating back some 400 years. 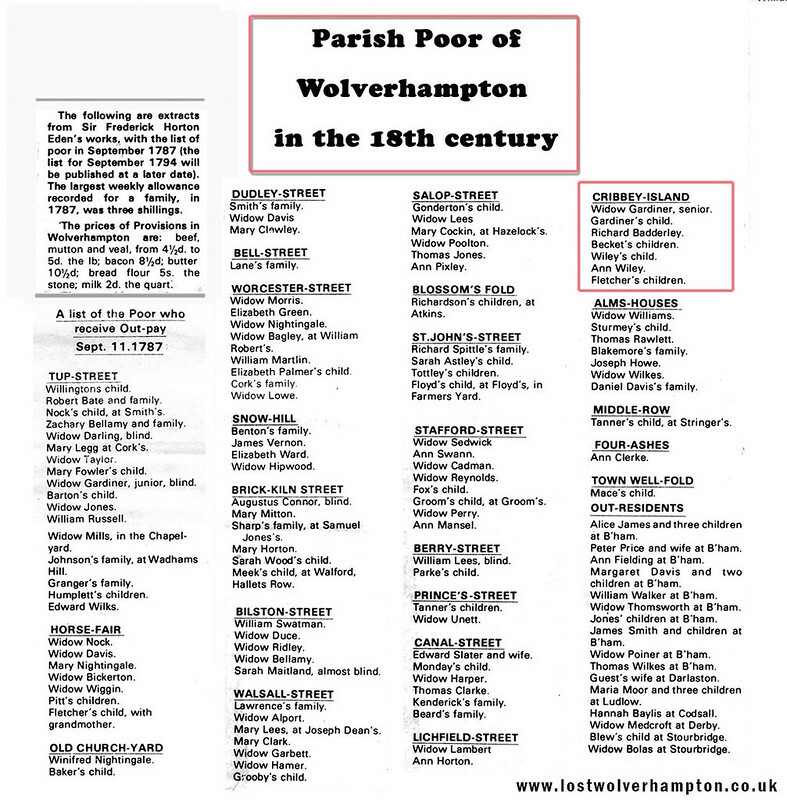 When my ancestors came over from Ireland during the famine, they came to Wolverhampton. Honoria Beattie gave birth to a son in the yard of the Dog and Partridge in Canal St. Yes, Marlene, just one of a dozen or so beerhouses in Canal Street in the mid-1800’s an F. Spencer was the licensee at the Dog & Partridge in 1868. If I may, I have recently published a book via YouCaxton of Oxford and Shrewsbury, called ‘Ironopolis – Standing Up For Wolverhampton’ – part of it is about analysing the ‘original Black Country’, but there are also detailed sections on Caribee Island and other sections of the town such as its very own ‘east end’ at Horsley Fields (the second’e’ was not used as in Horseley back then) and Monmore Green. In the 1800s Caribee Island was infamous and there are many reports about its appalling conditions gleaned from newspaper archives. There are also detailed sections about coal-mining in the town (yes there was a lot of it), and also its vast iron industry. Around 500 pages in all, so it is quite detailed.